You've seen it a hundred times, in any thriller that finds the hero perched on a ledge or on the edge of a building's rooftop. The camera moves up and tilts downward, in a smooth unbroken shot, so that we can all know that the actor is really standing there. By now we're more than ready for that shot (it's become fairly ho-hum). But there's no way that I was ready for the extraordinary, dread-inducing Look Ma, no safety net! sequence in "Mission: Impossible -- Ghost Protocol" where Tom Cruise makes his way across the surface of the Burj Khalifa in Dubai -- the world's tallest skyscraper -- while clinging to the building's glass panels with a pair of electrified adhesive gloves. 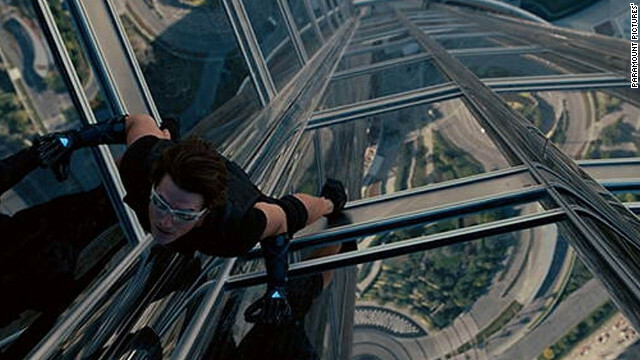 Cruise, as IMF agent Ethan Hunt, is trying to break into the suite that houses the skyscraper's -computer servers, and this is the only way he can do it without being detected from within. Brad Bird, the director of Ghost Protocol, knows all too well that the audience will be on the lookout for any tell-tale cut, any obvious digital image, anything at all that reveals that Tom Cruise isn't really on the side of that skyscraper. And damned if we can find one! This is a sequence so ingeniously conceived and shot that even the audience doesn't want to look down -- a sequence so death-defying that it gets you laughing at your own susceptibility (especially if, like me, you happen to have a fear of heights). Shimmying up and down and around the building's surface, with the ground looking as if it must be a mile below, Cruise becomes a fearless human bug (think Spider-Man without the superpowers). removing rear spindles - impossible? Turbo Filter Impossible - What are you guys using besides? MOVED: Turbo Filter Impossible - What are you guys using besides?